This is day 3 with no soda. I only wanted to kill everyone yesterday evening. I was sooo tired and grouchy!! I didn't really think about it being from not having any soda until this morning. Hopefully it will get better! Although I'm wondering if I am going to have to find a new "drink"
since my whiskey & coke contains COKE. Do you drink soda? What's your poison? I used to have a coke every day in the afternoon and another one in the evening.. I also drank cherry coke and Dr Pepper. I quit. Went cold turkey - No more pop! And I'm proud to say I'm pop-clean now. It's been 4.5 yrs and I don't even miss it. I don't like pop very much. I'm a water girl! I drink tons of water too, anyway...but ugh You're brave. 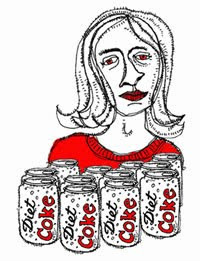 I need a 12 step program and a straight jacket before I could give up Diet Coke!